On the 18th of September 1995, the University acquired the Ceduna 1 Satellite Earth Station in South Australia. 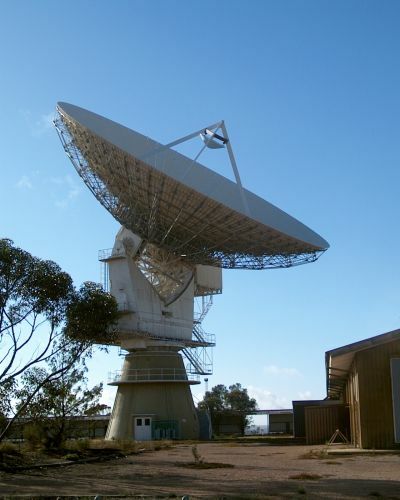 The site, with its 30 metre diameter antenna and several large buildings on 64 ha of land, were transferred to the University by Telstra Corporation Limited following the relocation of Ceduna's telecommunications functions to Perth. The aquisition of the landmark instrument has further boosted Tasmanias high status in Australian radio astronomy by providing the astrophysics group with control of 40% of the Australian VLBI Array. This insures that UTAS will be in a position to play a major role in this area of Australian science for many years to come. The University, as a national centre of excellence in radio astronomy with a long tradition of hands-on experience in this field, operates the facility as a stand alone instrument and in conjunction with other antennas in a VLBI array. The antenna has dramatically enhanced the Australian VLBI array, which includes existing radio telescopes in Hobart, Parkes, Mopra and Narrabri by providing a vital East-West extension required to map compact radio sources in the southern sky at high resolution and to study a range of important astrophysical problems. The facility has enabled participating institutions to provide high-quality teaching and postgraduate research in astrophysics, astronomy and geodesy and will strengthen Australia's international links through participation in key multinational research programs. It is part of the Swinburne Astronomy Online Course. The observatory is open to external users and for commercial tracking purposes. For information on aquiring observatory time, please contact the Director, Professor John M. Dickey.